This autumn 80 learning disabled artists will occupy contemporary and historical venues across Greater Manchester in PERSPECTIVES, a series of exhibitions, happenings and creative exchanges proudly presented by Venture Arts, a visual arts organisation who support and nurture the artwork and careers of learning disabled artists. From 1 October 2018 through to 24 February 2019, artworks developed over the last two years will be unveiled to the public for the first time in a number group shows including themes of collections, text and line, and photography. Exhibitions, happenings and accompanying events will take place citywide at multiple venues including; Fred Aldous Ltd, The Manchester Contemporary, Elizabeth Gaskell’s House, The Lowry, the Whitworth (Thursday Lates takeover), NOMA – Oh Ok Ltd, and Studio 53, Venture Arts’ new studio and exhibition space. On the 1-2 October, live from the Northern Quarters’ Fred Aldous Ltd art suppliers, artist Leslie Thompson from Venture Arts and Manchester artist and illustrator Matt Girling will draw inspiration from their memories, as well as capturing the bustling environment and passers-by in a large-scale site-specific drawing that will evolve into a fleeting interpretation of Manchester city life. From 12-14 October The Manchester Contemporary Art Fair (Booth 166) will see Castlefield Gallery and Venture Arts build on their longstanding partnership by presenting ‘Spilling out.’ This joint presentation includes new and existing works by artists who live and work in the North West region; Frances Disley, Barry Anthony Finan, Jennie Franklin, Katie Tomlinson, John Powell-Jones, Ahmed Mohammed and Leslie Thompson. Leslie Thompson, AKA ‘The Superstar Artist Drawer’ will be live capturing his interpretation of the fair on its opening evening of Friday 12 October. On consecutive weekends of 9-11 and 16-18 November, Venture Arts opens its new studio space in Hulme, Studio 53, with differing and unusual works each time exploring experimental art, photography, sculpture and moving image. These studio shows will offer visitors an insight into the artist’s creative practice, viewing the collection of artworks in situ where the work has been developed. Highlights include a re-appropriated record player that has collaboratively been transformed into a zoetrope of artistic pre-film animations and a 3D projection mapping installation. The Lowry, Salford Quays, will display artistic highlights of artwork created by young artists who regularly take part in Venture Arts’ Young People’s Art Club. Artwork from three local primary and secondary schools, who worked alongside learning disabled artists to create an eclectic range of artworks, will also feature in this joint exhibition launching the 24 November until February 2019. Venture Arts will host their second Thursday Lates event at the Whitworth on the 29 November, generating open conversations about the labeling of art within the contemporary art world. In the up and coming NOMA area in central Manchester, OH OK Ltd, will host an exhibition highlighting larger collections of artwork. Examples include Terry Williams grainy black and white photography documenting times gone by and holiday memories that capture his sense of northern nostalgia and his love of the seaside. Horace Lindezey also shares his fascination with weddings, and everything associated with them, across clay, embroidery and photomontage. Perspectives will share not only the different perspectives of the artists in terms of their artwork and disciplines, but also how they view and exist in the world today as practicing contemporary artists with learning disabilities. 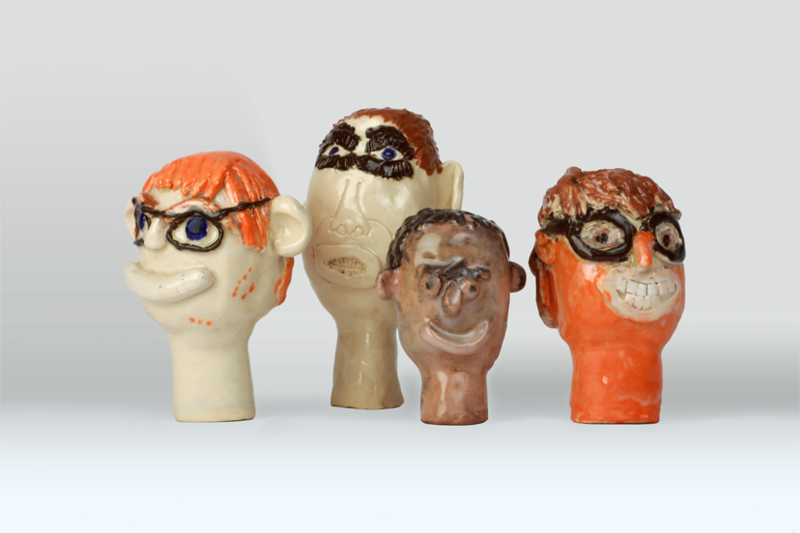 Photo: Ellie Walmsley Artwork: Ceramic heads by Darren Gallagher, Andrew Johnstone, Ahmed Mohammed, and Kathy Wilmot.